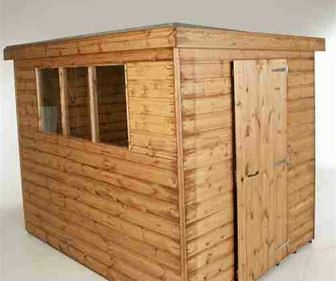 The Treetops Traditional Standard Pent Shed is an exceptional quality building. The pent design ensures easy installation, even in height restricted areas. The strong Shiplap tongue and groove cladding and pent roof really help to protect the shed from rot and other damp related problems. There are several models available in the Treetops Traditional Standard Pent Shed collection and this one comes with 3 customisable windows. As standard, the glass windows are fixed, but you do have the option to upgrade them to opening windows if preferred. A single door is provided and this also comes with numerous customisation options. Most of the sheds created by this brand allow you to alter the position of the door. However, this one comes with more options than most, giving you an incredible choice of five different placement options. You can also contact the manufacturer to arrange to have a stable door design. What’s remarkable about this shed is the fact that every detail, no matter how small, has been created to an incredible standard. We also love that the interior is also constructed from 12mm tongue and groove, rather than cheaper OSB materials. There is also a focus on security with this shed. This can be seen via the key operated lock included on the door. Not many sheds come with such high security so this is another stand-out feature of the Treetops Traditional brand. It’s hard to find any disadvantages with this shed. Being picky, we’d recommend looking for a better quality felt. The one supplied is good quality for the price, but it is a little thin. So a better, thicker felt would ensure the entire building has a superior quality design. This is a pent design storage shed, built with height restrictions in mind. Thanks to the sloping roof, you can assemble the shed underneath trees or in front/to the side of buildings. One thing we frequently notice with the majority of Treetops Traditional sheds is the door height. At 5’5”, it is a little shorter than the average shed door. So unless you’re shorter than average, you won’t be able to just walk right on in without banging your head. Ducking to enter the shed isn’t a massive issue however, but it is still something to be aware of. The width of the door on the other hand is fantastic. It’s extra-wide which makes it simple and quick to transfer large equipment. One way you can tell the quality of a shed is to look at its interior. Treetops Traditional is one of the few manufacturers that offer fully tongue and groove buildings. This means the roof and floor are constructed with tongue and groove, rather than cheaper chipboard style wood. There are two main benefits that come from this construction. Firstly it offers more stability and reliability, giving you better peace of mind. Secondly it ensures that heavier equipment can be stored in the shed without the risk of damage or collapse. As well as having excellent stability, the roof of this shed also benefits from a pent design. Whilst this does mean you won’t receive the same level of interior height as you would with an apex roof, it does offer a better space-saving design. It also offers great weather resistance, helping to protect the building from rot. 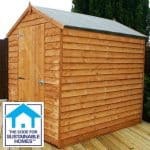 Redwood timber gives the shed a unique look as it isn’t commonly used by other manufacturers. This high quality timber features more golden tones which create a visually appealing design. The cladding has been PAR finished which means that the timber started out at 16mm and has been planed down to 12mm. This gives a very smooth and professional look which will look fantastic in any garden. 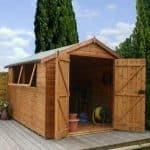 Shiplap tongue and groove is the best type of cladding used on garden sheds. It is thick, durable and naturally weather resistant. It comes with a few impressive benefits over overlap including more resistance to warping, an expansion gap to accommodate for any seasonal changes and tiny grooves built between the panels to drain rainwater off the walls. A 44mm x 27mm frame has been used for great stability and safety. You will need to use a high quality treatment around 6 weeks after installation and then every year afterwards to ensure it is constantly protected against the elements. Both the door and the windows included on this shed come with a range of customisation options. You can find full detailed information on the options available to you further down in the review. In this section we’ll discuss what is included as standard. 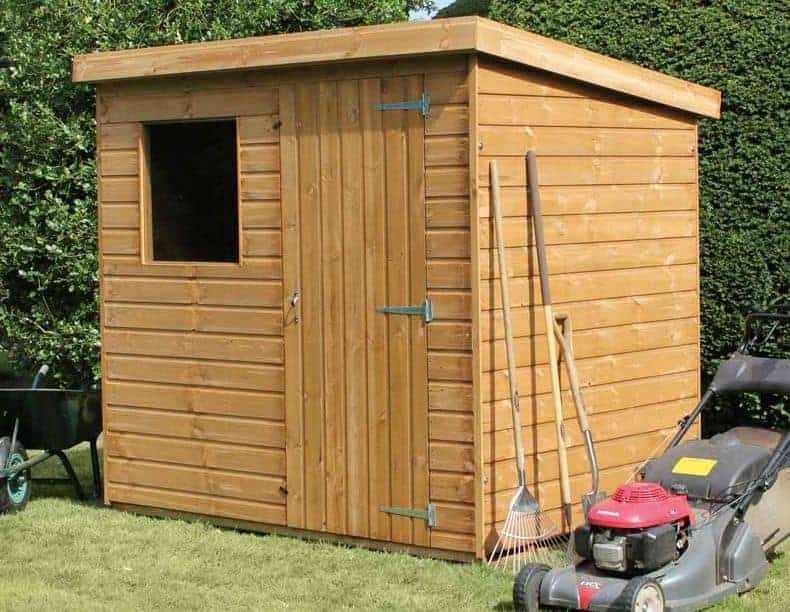 A well braced, extra-wide single door is included, allowing ultra-easy access into the shed. As mentioned earlier it could benefit from being a little taller but this isn’t a major issue. It is hinged in three places so wear and tear are never going to be a problem. It also has an integrated lock which operated via a key. You can’t tell from the picture, but the shed also comes with three fixed glass windows. As it features interchangeable sides, these windows can be located on either side of the building. Two are located on the side, whilst one is located on the front. As standard they come fixed so you won’t be able to open them. However, you can upgrade to opening as highlighted in the ‘Customisation Options and Extras’ section. The security of this shed is brilliant. An integrated key operated lock ensures nobody but you has access to the building. Its solid cladding also gives the shed a more secure design, ensuring its walls aren’t easy to break through. It’s great that no extra money needs to be spent on making the building more secure. The privacy however, will depend upon the customisation options you choose. If you keep the 3 fixed windows, unless you install curtains or blinds your storage will be open for everyone to see. However, if this is a big concern for you, you can always opt for the windowless model at no extra cost. 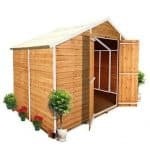 There are a large number of customisations and extras you can add to the shed. The door and windows are the main things you can alter to fit your preferences. With the windows, you can choose to upgrade them to opening windows. The obvious benefit of this is so that you can ventilate the shed during really hot weather. It helps to reduce the risk of mould, as well as making it more comfortable to use. Each window you choose to upgrade comes at an additional cost. You can also opt to have no windows added to the building. This offers a more secure and private design and it’s absolutely free. Your biggest customisation choice comes with the door. There are five different placement options, as well as the choice to upgrade to double doors. Another option which you can’t actually select but which is available if you contact the manufacturer, is a stable style single door. It is worth noting that if you choose the double doors, you won’t have the same placement options as the single door. It also costs extra to upgrade to double doors, but nothing to switch the placement of the door. An installation service is offered, though this is fairly expensive. How useful this service will be very much depends upon the customisation options you choose. Benefitting from an outstanding quality, even this sheds smaller details have been constructed to an incredibly high standard. The quality of the timber used in the construction of the shed gives it a very long lasting design. However, you do need to apply yearly treatments to keep it protected against the unpredictable weather. 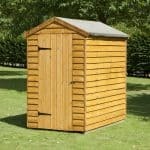 The storage space provided is excellent, making this the most popular sized shed in the UK. It also gives you the opportunity to add shelves and hooks for extra storage capabilities. It should take around 2-4 hours to assemble the shed. All instructions are provided and most customers have found it really easy to install. However, you do have the option to opt for the professional installation service. 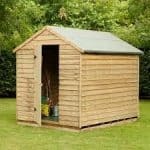 If you’re looking for a shed that will last, which offers exceptional features and is focused purely upon quality, this is an excellent choice. It provides great value and is definitely one of our favourite Treetops Traditional models. Final Thoughts: You’re sure to be impressed by the sensational quality Treetops Traditional Standard Pent Shed. 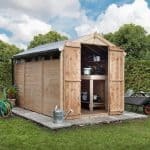 Offering an impeccable design with a focus on quality and durability, this shed isn’t just practical – it’s stylish too. Armed with an abundance of weather resistant features, what sets this shed apart is its range of door and window customisation options. You are able to alter the position and style of the door, as well as upgrade the 3 fixed windows to opening windows. Or if privacy is really important to you, why not opt for a windowless design instead? This truly is a magnificent building that is guaranteed to keep your storage safe and dry for many years.